Woodcock and Springers... What a Pair! These two words will make me forget the well thought out plan for the day. For when someone inquires about hunting these unique birds, my focus quickly changes - and my attitude improves immensely. The only other thing that has a similar effect are the words "Springer Spaniel". Whenever the four words are put together, my concentration is blown for the day. 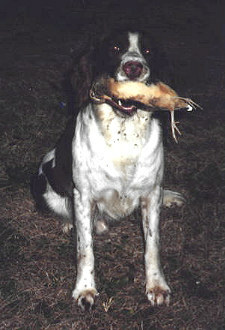 There is no other kind of hunting that I enjoy more than hunting woodcocks... and the only way I enjoy hunting woodcocks is with my English springer spaniels. In my opinion, the two were made for each other. Now I know that woodcock enthusiasts have hunted woodcocks for years with the many pointing breeds. The pointing dog hunters don’t understand the spanielers and vice-versa. If everyone liked the same thing, there wouldn’t be so many different hunting dogs. But for me, I am addicted to hunting woodcocks with springers. I live and hunt in the Southwest Missouri area - which is not listed in the woodcock manuals as a location for prime woodcock hunting opportunities. And likewise, you will seldom come across another hunter with springer spaniels in the dog box. Both are relatively unknowns to the hunting community in this part of the country - and when mentioned, brings an onslaught of questions from the curious. Matter of fact, even the conservation agents are not aware that the woodcocks migrate through the region in huntable numbers. "Someone once wrote, "If you throw your hat down and it hits the ground, you are not in woodcock cover."